Like many places in India that are in transition from village to town, the infrastructure for water, sanitation and waste management is woefully inadequate in Orchha. Open defecation is still the norm, plastic waste is scattered along the roadsides and new houses are constructed without proper drainage or waste water treatment. 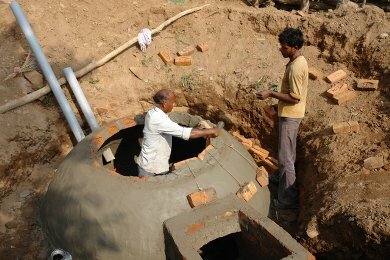 Friends of Orchha is demonstrating eco-friendly techniques of construction and sanitation in its home-stay project. In constructing the home-stay rooms, particular attention has been paid to ventilation and insulation. The brick walls have been constructed using the "rat-trap" technique that leaves hollow spaces within the wall that help keep the room cool in summer and warm in winter. Windows have been placed not only to provide beautiful views of Orchha, wherever possible, but also to ensure cross-ventilation of the room. Roofs are sloping and covered with clay tiles, a tradition that is better suited to the climate than the flat, concrete roofs that are mushrooming elsewhere in Orchha. Each house has a newly constructed bathroom and toilet that allows water and waste to be recycled. Waste water from the baths passes through a sand filter and is then used for irrigation. Two of the six houses have dry, composting Ecosan toilets. These produce excellent compost that can completely replace chemical fertilisers. In a household that possess buffaloes, the toilet is linked to a bio-gas digester. As the gas is used for cooking in place of wood, we help prevent deforestation and global warming. Besides,the effluent from the digester is an excellent organic fertiliser. To avoid the accumulation of mineral water bottles, we have installed a three-stage water filter in one of the homes. It is filled each day with well water and is safe for drinking. This is sold to our guests at Rs. 5 per litre. We envisage further improvements, such as the use of solar energy, to further reduce the carbon footprint of the Orchha home-stay.